WordPress is that highest chosen platform for blogging. This is because of the features that WordPress offers bloggers. 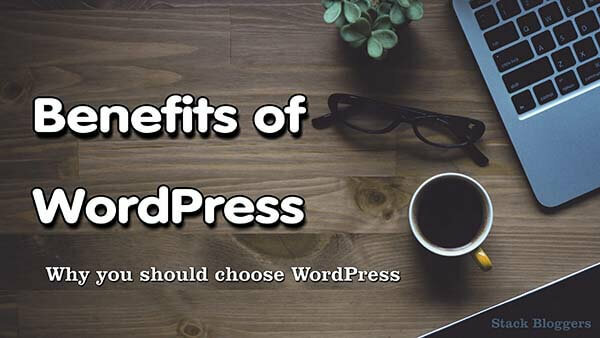 WordPress is an opensource application, there for a lot of people are helping in developing WordPress and this is one of the Benefits Of WordPress. Now WordPress is the best Content Management System and almost everyone opts for WordPress. WordPress is free to use and it doesn’t need technical skills to operate. No coding is needed to work with WordPress, very thing could be done with just a click. Many think that it creating a WordPress website costs too much. No, it doesn’t. You could even start a WordPress Blog for 11$. This is the cheapest way for creating a self-hosted WordPress blog. Create on WordPress blog for your self now itself. WordPress can be customized for search engines easily. You just have to install few plugins and set it up. WordPress has many free and paid plugins for this. Yoast is one of the best plugins for SEO on WordPress. WordPress is really easy to use. It provides us with plugins which will help us do things easily. WordPress site can be built in just a few clicks and that one of its biggest Benefits of WordPress Blogs. Anyone who has no programming knowledge can create an awesome looking WordPress Blog. WordPress has a lot of themes that you can use on your blog and all of them are fully customizable. Giving you full control over your website in few clicks. WordPress can also be installed on any hosting easily and there would be a one-click installation for WordPress. WordPress plugins are the most important Benefits of WordPress blogs. With plugins, you could create anything in few clicks. There are many developers out there who have created many plugins for WordPress making WordPress the best Content Management System. WordPress got a large community of developers who are ready to help. You could ask for your queries at the WordPress Forum and you would get a replay within 1-2 days. You could easily use and manage WordPress with its enormous support community. WordPress also provides paid and free security plugins. WordPress only lags a little in this, WordPress is not as much secured as other platforms and there are many reasons for it. Still, you could ensure your security using plugins. Most of the top security plugins are paid and that the only demerit. A WordPress blog can be customized fully without much effort. WordPress Themes are well coded and almost all of them can be customized according to your wish. There are a lot of themes that suit your Business Website, E-commerce website, Blog etc making WordPress the best platform. WordPress is the best Platform that you could use to build your Website. WordPress provides you an easy to use interface. You could build a Profesional looking website in few clicks. Customization is one of the main Benefits of WordPress. Search Customization can be done by installing plugins making it easy for you to rank your website higher. I recommend using WordPress than any other platforms. I’m also interested in this topic and have recently started my journey as a young entrepreneur. I’m also looking for the ways on how to promote my website. I have tried AdSense and Facebook Ads, however, it is getting very expensive. Was thinking about starting using analytics. Do you recommend it? I also want to improve SEO for my website. Would appreciate, if you can have a quick look at my website and give me an advice what I should improve.